15 Gorgeous Kurtas For The Girl Who Loves To Wear Black! Ladies, we all know that black has always got our back, which is why we can never have enough of this colour in our wardrobe. Be it dresses or traditional wear, black rules them all. So we found these 15 really pretty black kurtas for women that will make you want all of them. And guess what? They are all under Rs 700! We absolutely love this pretty kurta from Sangria. Just look at the dual coloured buttons, aren’t they just so cute? Pair it with a long skirt and sneakers for a dash of quirk. So different and yet so cool, right? Price: Rs 675. Buy it here. We fell in love the moment we stumbled upon this gorgeous printed kurta. It is made of pure cotton, has quarter sleeves, a round neck and will definitely flatter you, irrespective of your body shape. Price: Rs 549. Buy it here. Look classy AF in this gorgeous kurta with embellished details on the neckline and an interesting hem. Pair it up with straight fit pants, skinny jeans or palazzos for a classy cocktail look. Price: Rs 630. Buy it here. We absolutely love this kurti, the colour combinations and the prints are super. Pair it up with a beautiful patiala salwar and accessorize with silver jewellery to rock the look in style. Price: Rs 500. Buy it here. 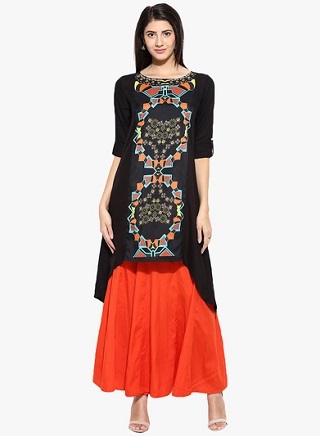 This kurti from AJIO is one of our faves. We love the detailed neckline as well as the printed details on the arm holes. You can pair it up with a patiala salwar or with jeans for a fusion look. Love mandarin collars? Then this kurta is going to be your favourite. Featuring a beautiful gold print with quarter sleeves, this will look great with palazzos in the same or contrasting colours. Price: Rs 675. Buy it here. This beautiful kurta has such vibrant colours that it will make your dullest days look oh-so pretty. Not to forget the unique hem which gives it a modern look. Pair it with a bright coloured skirt and you will stand out in the crowd. Price: Rs 629. Buy it here. If you are looking for something that you could wear to office or college, then this kurti will definitely put an end to all your searches. Featuring a boat neckline, this kurti will look great paired with straight pants or palazzos. Price: Rs 499. Buy it here. 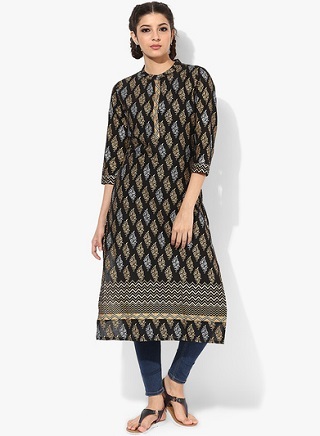 Another one in the simple office/ college wear league is this pretty black kurta featuring bright printed details on the yoke. You can pair it up with leggings, jeans, pants or palazzos. It will look good with anything. Price: Rs 550. Buy it here. This kurta can be your saviour this wedding season, just look at the print and the bright border. Pair it up with a salwar and wear golden heavy earrings for a perfect wedding ready outfit. This kurta from Sangria has stolen our hearts. Featuring white print on the black fabric, this one will definitely make you trade your western clothes for Indian wear. Price: Rs 525. Buy it here. Featuring detailing on the neckline and a pretty polka dot print, this kurta will look amazing with contrasting leggings, a skirt or palazzos and earrings. It’s so perfect for daily wear! Price: Rs 525. Buy it here. We love the curved hemline in this simple, sleeveless kurta. Featuring a keyhole neckline and print details, it’s so pretty that we want it right away. Price: Rs 699. Buy it here. If you love fusion wear, then you will definitely love this kurti. It is perfect for pairing up with jeans and skirts and will help make a very beautiful fusion outfit. Price: Rs 559. Buy it here. 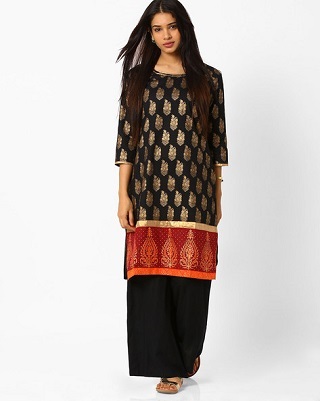 This one’s perfect for the girl who is looking for a plain black kurta. It can be paired up with printed palazzos or bright coloured salwars with a coloured dupatta for a simple yet pretty look. You can’t go wrong with this.